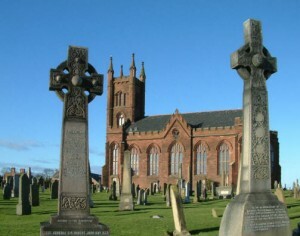 The present Dunbar Parish Church was built on the site of the old Collegiate Church which was used for the last time on Sunday, 7th March 1819 and thereafter demolished. “This venerable fabric had all the appearance of being the workmanship of different ages. It was built in the form of a cross, measuring one hundred and twenty feet in length, while it was only from twenty to twenty five feet broad, the transept or cross-aisle measuring eighty three feet.” (Miller, History of Dunbar).